An Egyptian Hieroglyphic Dictionary, a two volume set written by Egyptian expert E.A. Wallis Budge, is quite simply one of the most comprehensive and detailed dictionaries of Egyptian hieroglyphs with English to accompany it. 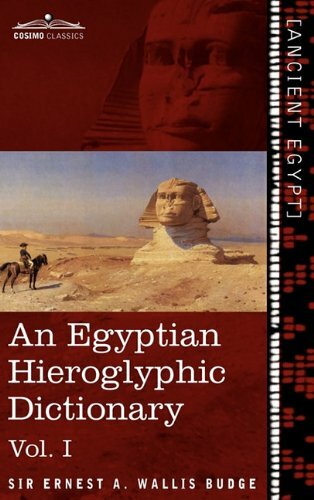 The series includes a detailed Introduction by the author with key words and glyphs, a bibliography of works used to help with translation and research, glyphs organized alphabetically by the Egyptian alphabet with accompanying words and English translations, tables of hieroglyphs with phonetic and numeric values and accompanying translations, lists of both Egyptian kinds and locations, and an Index of both English and Egyptian words. Volume II includes letters "S" through "TCH" of hieroglyphs and translations, a list of Egyptian kings and geographical locations, and the Indexes.